Cheltenham Town have extended the loan deal of Nottingham Forest midfielder Matt Thornhill. The 21-year-old will now remain at Whaddon Road until the end of the season having originally signed a one-month loan deal two weeks ago. Due to Cheltenham's postponed fixture at home to Darlington on Saturday Thornhill has only played in the 4-1 defeat by Rochdale. He has been at the City Ground since 2007, making 38 league appearances. 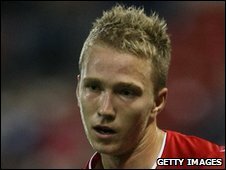 "Forest have told me to go out and get some experience," Thornhill told BBC Radio Gloucestershire. "I want to play as many games as possible and help Cheltenham get out of that relegation battle and with a couple of wins we can push further away from there." Meanwhile, defender David Pipe has returned to parent club Bristol Rovers after his loan spell with Cheltenham came to an end. The 26-year-old Welsh international full-back joined the Robins in November but the club has not taken up the option of extending the loan for the second half of the season.